If you’re in need of exciting amusement rides for school or community fairs, why not call us today? We get that your traditional community and school fairs would consist of amusement rides such as merry-go-rounds, pluck a duck, dunking tanks, a clown show and other carnival rides, but this is now, and children demand more modern entertainment for their kid’s parties in order to say they’ve had a good time. Game Vault provides the ultimate video game experience for school and community events. Using our services means that you are treated to one of the most popular mobile gaming services that is recognised across Perth for nothing less than brilliant fun. Used by schools for incursions, kids birthday parties, adult’s birthday parties, corporate events and carnival amusements, we really do have what it takes to draw in a crowd. Attract a mass of fun-loving individuals with our limousine styled gaming bus, ideal for commercial and corporate fundraising, which is customised to include a stylish interior fully kitted with state-of-the-art technology. Our music system is designed to deliver nothing less than the perfect sound, while our LED screens project a host of games that appeal to every kind of fun-loving spirit. Choose from our wide range of games that cater for everyone from children as young as 6 to the older crowd who want to embrace their inner child. Like any event, our event activities are overseen by our highly qualified team who operate the customised system and provide a professional service to ensure you and your patrons are completely satisfied. All staff have valid working with children cards are covered for the appropriate insurances. As a trusted source for OSHC, you can be certain that using Game Vault for games at your community events, you are hiring the best amusement experience in the mobile video gaming industry. A popular choice in both the summer and winter months, our wide range of interactive games are great amusement activities for festivals as they draw in large crowds. Kids, teenagers and adults find it hard to draw themselves away from the massive amount of fun they’re having. It’s a major attraction that offers a convenient and stress-free environment for all. 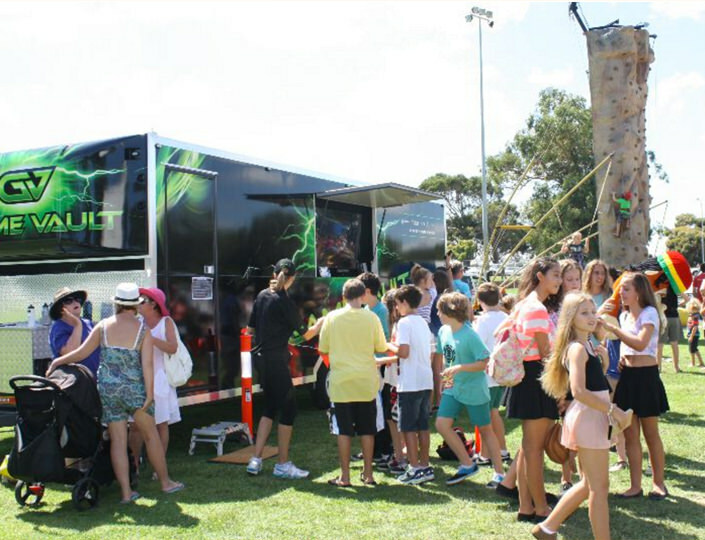 Game Vault will attend any kid’s birthday party, fundraising activities at events, and weddings or simple family fun days, all within a 40km radius of Perth. If you are hosting a function or party just outside the radius area, don’t feel left out. For a nominal fuel surcharge, we will bring our mobile gaming truck of fun, to you. Look no further than Game Vault for your party and fundraising games and entertainment. Our highly equipped mobile gaming van will see your kid’s party or indeed any other event, turn into an epic event, with adults and children coming back for more, every time.